Queen bees are made, not born, and their feeding with royal jelly is the key to that process. Without this special food, queen bees would fail to develop properly. Royal jelly is a thick, extremely nutritious, milky-white, creamy liquid secreted by the hypopharyngeal glands of the nurse bees. Queen bees live exclusively on royal jelly and it accounts for their incredible size and longevity. • They average 42 percent larger and weigh 60 percent more than the worker bee. Amazingly, they live 40 times longer than worker bees, seven years as compared to seven weeks. • Biochemically speaking, royal jelly is very complex. It is a very rich source of proteins and contains eight essential amino acids, important fatty acids, sugars, sterols and phosphorous compounds as well as acetylcholine. Acetylcholine plays a nutritional role in focus, brain and sexual function It contains gamma globulin, known to stimulate the immune system and fight off infections. • Royal jelly is an excellent source of nutrients and is gentle to the system. • Royal jelly contains vitamins A, B-complex, C, D and E. It is particularly useful for its B-complex contents, including B1, B2, B6, B12, biotin, folic acid, and inositol. Royal jelly is high in the B vitamin pantothenic acid, recognized for its ability to reduce stress levels. It also supplies the minerals, calcium, copper, iron, phosphorous, potassium, silicon and sulfur. Although royal jelly has been traditionally used to prolong youthfulness and improve the skin beauty, evidence indicates that this substance increases energy, alleviates anxiety, sleeplessness, moodiness, and supports the immune system. Kiwi Natural Health Royal Jelly is great to take in conjunction with Evening Primrose Oil. Royal Jelly is great to support healthy skin, and nails as well as boosts energy. While evening primrose oil is also great for the hair, skin and nails, is also helps balance hormones to calm mood and improve skin clarity. Evening Primrose Oil has been used by many women to help regulate their menstrual cycle and decrease the pain associated with menses. Taken together Evening Primrose Oil and Royal Jelly create the ultimate tonic for beauty and wellness for women of any age! 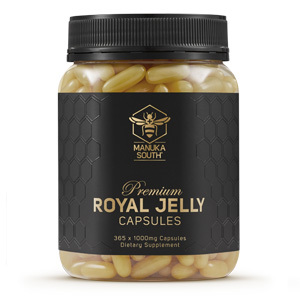 Bonus: Royal Jelly capsules can be cut open and smoothed over the face as a face mask. Leave on for 20-10 minutes then rinse off with warm water. Skin will be left hydrated, nourished and supple. Follow with a good moisturizer such as Wild Ferns Bee Venom day or night creme. Take 1-3 capsules daily or as directed by your health professional. Always read the label. Take only as directed. Not recommended for asthma and allergy sufferers as bee products may cause severe allergic reactions. I love this product. I have really noticed an increase in my energy levels. It’s also great quality and great value.